The Packing District, Kelowna, BC – PC Urban Properties Corp.
One hundred years ago, the fruit industry defined Kelowna’s working life. Growers and shipping companies built warehouses and packing plants to handle the growing bounty being harvested from the Okanagan Valley. Today, fresh energy and industry is driving change in central Kelowna. 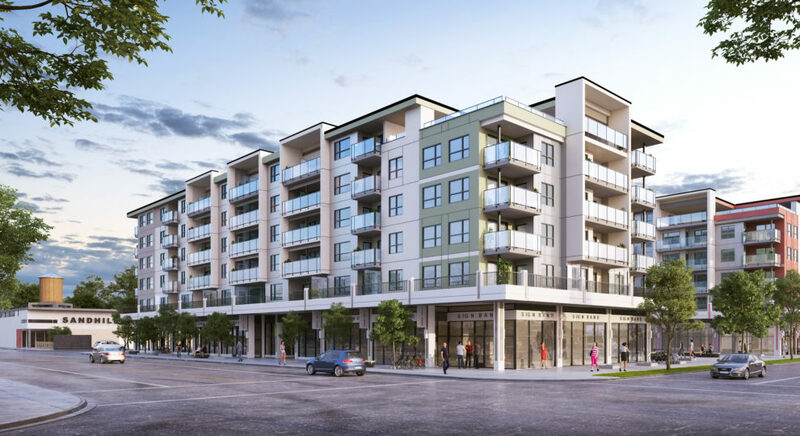 At the corner of Clement and Richter, is a property that will do more than re-imagine a balance of residential, retail and commercial development. It will redefine the character of the neighbourhood itself. The Packing District does not seek to gloss over the industrial character of its location, but will instead celebrate it. Solid industrial materials and historic design references blend with modern design and urban planning to set the tone for city’s newest and oldest neighbourhood. This will be the new gateway to the emerging urban core. A truly appropriate introduction to an evolving and vital city neighbourhood. Project Size – 210,000 sq. ft.